I feel so privileged to live the above statement on a daily basis through our work at Kate Tempesta Urban Golf Academy (KTUGA). Our primary mission is to empower children through the game of golf. KTUGA strives to create a safe, whole child and joyful learning environment. We are constantly assessing where each child is in their social, emotional, cognitive and physical development so that we can create an effective classroom. We believe this leads to children discovering and revealing their unique gifts. I’d like to give you an example of how powerful sport can be. This is just one of many examples, but the story of Cindy will be with me forever. It was a cold February day when we walked into PS 2 in Chinatown. 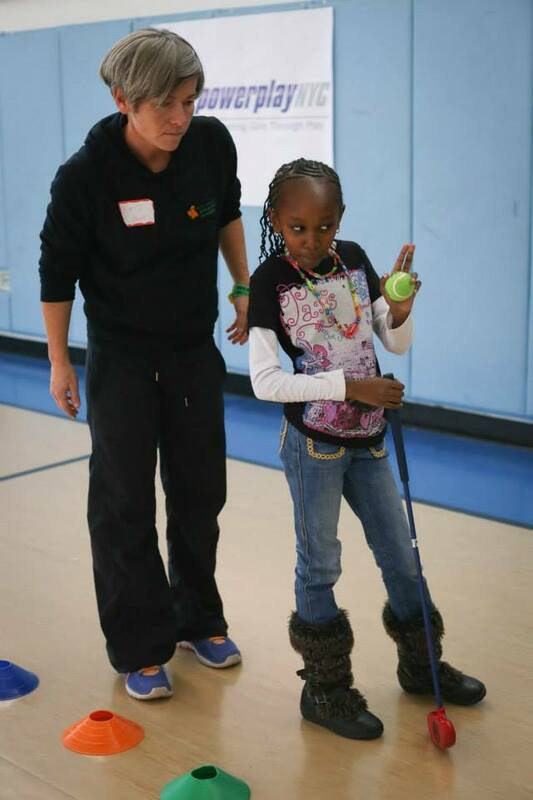 We were getting ready to pilot a 6-week golf program with 20 girls ages 7-10 from PowerPlay NYC. We got to know these girls pretty quickly through ice breaking games, movement activities and our favorite “connector” – circle time. There were the class clowns, the sassy girls, the sweet, curious and eager girls and then there was Cindy. She was quiet, always looking at the floor. She was afraid to speak. When it came time for activities she shied away and into the background. When it came time to split the girls up into groups I overheard several girls saying they didn’t want to be on Cindy’s team. It was heartbreaking to watch Cindy be ostracized by her peers and even more so to witness her continuing to build a wall to the outside world. Many gentle attempts to engage her didn’t work. On our second visit she continued to sit outside the circle. She refused to play in any warm-up games and she quietly protested trying her hand at any of the golf games. It wasn’t until the 3rd day that something started to shift. It was at the putting station. It was at the end and we were ready to transition the girls to the next activity. Cindy had been watching but wasn’t an active participant. I noticed Cindy look over at the putter as soon as the other girls left the area. Very timidly she walked up to it, grabbed a ball and gave it a try. Of course she looked around to make sure no one was watching. It was then that I witnessed magic starting to happen. It was then that the power of sport shined a spotlight on Cindy and helped her out of her shell. Cindy had been looking down the entire time I knew her but this time was very different. This time, she looked down and found success. She started to make a few putts. She allowed herself some smiles and the most powerful force of all was that she gave herself permission to PLAY. Knowing the next rotation for her was full swing I decided to invite her to stay with me at the putting station. I let her be alone in the game, giving her the space to explore and take risks without fear of being judged by the other girls. As the next 20 minutes went by I continued to witness Cindy open up to the world. I watched her wall start to crumble as she gained confidence in herself. This continued to be the case over the next 3 sessions. Cindy experienced more and more joy in every lesson. She took part in all of the activities moving forward and her smiles were as bright as the sun. She showed us all a sense of humor and a playful side we hadn’t seen before. I suspect it was because Cindy felt so confident that she then went on to help other girls struggling to make some putts. It was over the course of the next three sessions that her peers had now wanted her on the team. Connection was happening and the girls were inspired and united. I don’t teach golf so that children can have a perfect grip and swing. I don’t teach golf because I want my students to be number one. I teach golf because of the power of sport and I teach because of the Cindys of the world.